“You could call a man a bum with disgust on your morning run. ‘Cause he lives outside in the street, you don’t know this, but you’ve failed to realize that the one you so despise reflects yourself ’cause every Black man is homeless.” KRS-One has never hidden the fact that he was homeless for a number of years prior to forming Boogie Down Productions. He has rapped about it in songs, spoken about it in interviews, and even guest hosted a special edition of BET’s Rap City, where he went to a homeless shelter for youths, to speak with the young men living there and give viewers a firsthand education of the types of issues the youths faced. As reflected in the above quote from his Boogie Down Productions song “The Homeless,” KRS often has taken an expansive view of homelessness, using it to describe the condition of Blacks in America, and also equating it to Hip-Hop culture. In a 2011 interview with Street Roots News, Kris said of Hip-Hop “Hip-hop is homeless. Hip-hop doesn’t have a home. People take from it. Gospel loves taking from Hip-Hop, but loves calling it the devil’s music. Rock’n’roll takes elements from it. Where is the Hip-Hop museum? ” Ironically, it was the merger of Hip-Hop and homelessness that would ultimately take KRS-One from the streets and catapult him into international stardom. Even when the records broke through, things did not change overnight for KRS and Scott. “Even when I had ‘South Bronx’ out, ‘South Bronx’ and ‘Bridge Is Over,’ I was still homeless,” said Kris to The Activest. “When ‘South Bronx’ and ‘Bridge Is Over’ was out, I was sleeping on the train. I would be sitting [on the train] and people would have a boombox out, and they’d be blasting ‘South Bronx’…And, I’d be sitting right there. Because, then, there was no video, no magazine cover, nothing. You put out a record, no one knew who you was. So, I’d be sitting right there, record [playing], and I can’t smile, I can’t frown, I have to be completely [unemotional] because I don’t want anyone to know or even think that this is me. The guy you think is large and all of this, he’s right next to you homeless.” Sadly, as most know, DJ Scott La Rock was shot and killed just months after the records were released. 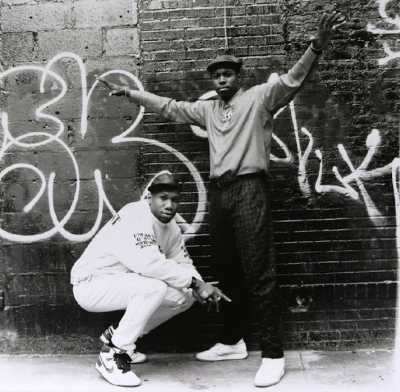 Despite their origins against all odds, and the tragedies that befell Boogie Down Productions from the start, the group, and KRS have gone on to be one of the most well-respected and influential artists in all of Hip-Hop. They are a living testament to the can’t stop, won’t stop ethos that has permeated the culture from the beginning.